Transportation industry leaders say they want the federal government to take a more active role in establishing regulations for autonomous vehicles and emerging vehicle safety technology. Lee Bauer, vice president of mobility architecture group at the transportation technology company Aptiv Plc, said a lack of national standards is making things more difficult for his company, which is currently deploying its technology in three U.S. cities. Bauer was one of five panelists at the Advanced Manufacturing & Logistics event, which was presented by Conexus Indiana and IBJ. 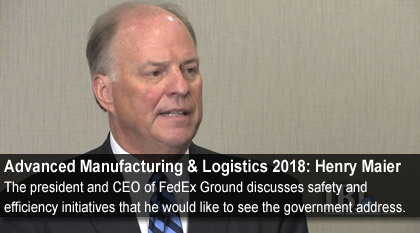 Keynote speaker Henry Maier, president and CEO of FedEx Ground, said the deployment of autonomous vehicles would be revolutionary in numerous ways: improving highway safety, making transportation more efficient and solving the trucking industry’s long-standing driver shortage. As of now, the federal government has not set any national standards for autonomous vehicles, which Maier said is inhibiting deployment of the technology. Without national standards, he said, operators could potentially face different rules in different states, making interstate operation of autonomous vehicles tricky. “We’re going to have to deal with 48 or 50 states to get this done because I don’t see anything happening in Washington right now that would suggest there’s going to be any national standard for autonomous vehicles,” Maier said. To date, the National Highway Traffic Safety Administration has not issued any standards regarding autonomous vehicles. Last fall, the administration released what it called “voluntary guidance” for industry leaders and U.S. states. Panel moderator Brandye Hendrickson, acting administrator of the Federal Highway Administration, said the federal government is taking a collaborative approach to emerging technology, soliciting industry input rather than imposing standards. “At the Federal Highway Administration and the [Department of Transportation], we’re really working hard to create an environment that wants to advance innovation and create a framework of collaboration without putting restrictive barriers that really stifle innovation,” Hendrickson said. Panelist Tom Linebarger, chairman and CEO of engine-maker Cummins Inc., said regulatory standards are just one part of the infrastructure that needs to be in place to prepare for autonomous vehicles and other emerging transportation technology. Taking a longer view, Linebarger said it always takes longer for infrastructure to catch up with technology advances. This, he said, is because a new technology can come from a single company, whereas infrastructure—highway funding, legislation and industry standards—is only developed through consensus, which takes longer to achieve.